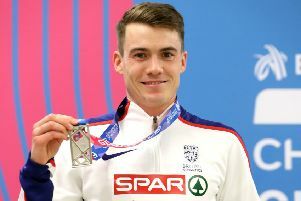 Seven years had passed since Mo Farah was last defeated by a fellow British athlete but Callum Hawkins broke the spell in Holyrood Park on Saturday and then confessed his intention to retain the upper hand. A far-from-fully fit Farah was marooned in seventh in the Great Edinburgh International cross-country in what figures to be his final outing in the Capital after a bug left him without his familiar extra gear. He was last beaten by a British runner when third in 2010. Hawkins seized the initiative with the Scot seemingly destined for victory before Kenyan-born American Leonard Korir accelerated past in the closing metres of the men’s 8km race. “I watched the American Olympic trials, I knew he was a quality athlete,” the Euro Cross bronze medallist admitted. Farah was more than half a minute behind and just one place in front of defending champion Garrett Heath. He jetted back to the States last night to fully recover but insisted his plans for this summer’s world championships in London are still on track. This was merely a minor setback for the four-time Olympic gold medallist, although he conceded this was still a reminder that only his best will suffice. And Hawkins, who will likely meet Farah again when the veteran winds down his career in the marathon, conceded this was not a victory to crow about. Korir’s triumph helped the USA take overall victory in the points standings ahead of Team Europe with GB&NI third despite Harriet Knowles-Jones’ rampant victory in the junior women’s event and the power of British team captain Laura Muir to claim top spot in the 4x1km relay with Scotland A fading from first to third on the final leg. Yasemin Can won the senior women’s 6km with Scots pair Beth Potter 14th and Steph Twell 16th with the European 5000m bronze medallist claiming Muir has moved into a whole new stratosphere following her UK indoor record over that distance last week. “It’s an inspiration to think that a British female, a Scottish female as well, is doing that in such a great strong team,” Twell said. “You can tell a lot from what she’s chosen to race and what she’s choosing to do and how she’s done that and I think there’s a lot to take from that. “You should always think: ‘why over-complicate things?’ And Laura does make it look very simple. You kind of think how do you strip back and make it even simpler. The East, led by Central AC’s Morag MacLarty, won the women’s Inter-Districts in Holyrood with Edinburgh University’s Anna MacFadyen coming third overall to take the junior title. Kris Jones took victory in the men’s race as the East edged out the West with another Edinburgh student, Logan Rees, claiming junior honours.